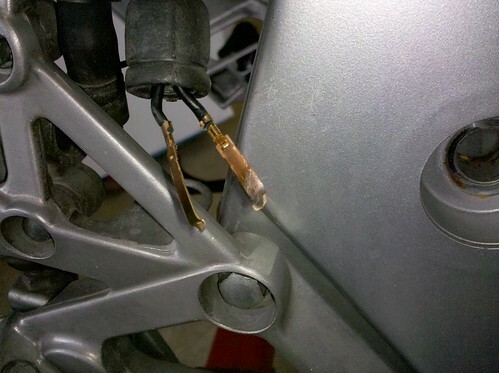 Was reinstalling my rearset yesterday and noticed the brake switch wasn't making the light illuminate. I had seen the other how-to here on cleaning up the front brake switch, and knew this wasn't going to be much different. Squeeze the spring clip together and work it off of the rubber boot. Slide the rubber boot up the wiring a bit. Here you will see the upper cap has 2 ears that snap into the housing. You need to wedge something in to allow the upper cap to be worked out - I used a sharp pointed hook-tool. look at the brass sleeve on the rod assembly - you will see where the contacts have been riding along that sleeve over the years. I started with some 80-grit sandpaper and burnished the sleeve. Then I switched to a fine small file on the whole sleeve. These tips of these contacts are what contact the brass sleeve and complete the brake circuit. Mine were so corroded up that I couldn't touch them directly together at the tips and complete the circuit. You see where the ends of the contacts angle in - I used needlenose pliers and bent these inwards just a hair more, right at the tips. Then I roughed the contact points with 80-grit, and then the inner valley with a small triangle file. With the corrosion removed, now you should be able to touch the 2 contacts together and make the brakelight illuminate. If this doesn't fix your problem, the issue is elsewhere. Assembly is the reverse of disassembly, you'll just need to readjust your rear switch once you have everything back in place because it is likely now the switch might illuminate the light much earlier in the pedal throw, or without the pedal depressed. I'm not sure if this helped anyone else but I just used it on my switch and it's working great now. Thanks for the write up. One thing i'll add. 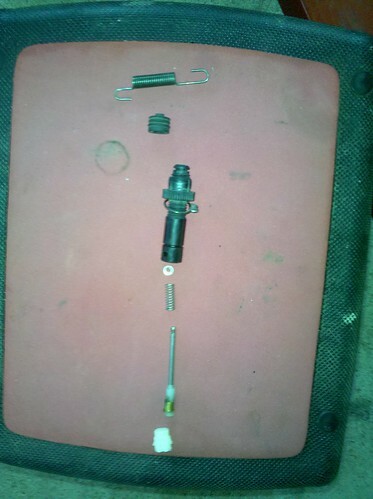 When you reassemble put the shaft between the two contacts and then slide it all into the housing. You'll never get the contacts over the brass part on top of the shaft if you put it in first then try and put the cap on. If that doesn't make a lot of sense it should be more clear once you go to put it back together and see what I'm talking about. Very easy fix though. I took my switch right off the bike and did it at the table. Took all of 20 min or so total. Just put some woodcraft rear sets on and had to make a custom mount for my rear brake switch. It's just a little higher than it was but it doesn't seem to like to turn on to well now. I'm certainly going to pull it apart this weekend and clean the whole thing up now that you showed me how. Thanks so much !